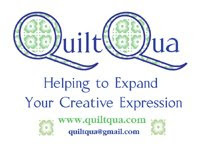 I had a good time at the Dulles Quilt Show with Susan at Quixotic Crafter. We were there early enough to be in a line to get through the front door and late enough the parking lot was relatively empty as we walked out. We looked at the quilts (a few are below for your enjoyment) and then we ate and shopped. Not a healthy meal day but not horrible either. I didn't buy too much but did get fabrics for my new projects and probably drove Susan crazy with my indecision but she was a good sport and didn't complain. I also scored some self-threading needles I'm estatic to try. It's for sinking your threads after quilting. Now, onto what you really care about, here are some of the quilts (with labels for credit except the last one that was blurry & which stinks b/c I was thinking of getting that pattern). I think we need to go to Houston or Paducah to shop next time. I've got the pattern. It's in McCalls Quilting Nov/Dec 2009. I'll hook you up. Walking in a Winter Wonderland is pretty amazing. How many ideas did you come home with ? Great quilts! Thanks for sharing. Just making the rounds and checking in to see how those PhDs are coming along... The count down is on! Favorite Things Friday - Quilt Shows!